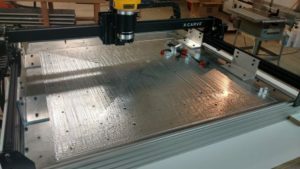 New 3-Axis CNC Routers – Northwind Composites, L.L.C. This summer and fall have been ridiculously busy. Not only have we expanded the shop but we have also been building a house to put some real roots down in beautiful Sandpoint. However, that has not stopped us from continuing to expand our capabilities. 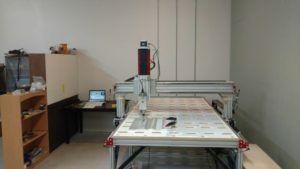 We are pleased to announce that we now have two 3-axis CNC routers up and running! Our first, and pride and joy, is a superb low-volume production router. It is a real work horse with a working area of 98in x 49in x 11in and complemented with a 220V spindle holding a tolerance of +/- .010in. This machine is capable of milling parts or molds out tooling boards, foam, wood, and aluminum. The second is a small prototyping machine good for most soft/medium density materials. It has a working envelope of 30in x 30in x 3in with a precision of +/- .020in. It has some great functionality for small items that need turned quickly and can handle the larger tolerance. The addition of these routers allows us to bring all levels of tooling fabrication in house and offer much more flexibility in meeting unique design challenges. It also allows our customers access to much cheaper tooling, opening the door to projects that would otherwise be too expensive. So as always, please let us know if you have any ideas you want to turn into wonderful composite goodness.